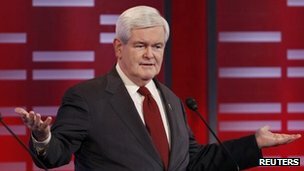 US Presidential election candidate Newt Gingrich has made the astonishing claim that the Palestinians are an "invented" people. His claim is not a particularly new one; back in 1969, Israel's then prime minister Golda Meir commented that there was no such thing as the Palestinian people. In fairness to people who make these outlandish claims, they are not asserting that the various people who are described by themselves or others as Palestinians do not exist, but rather that any Palestinian identity is an artificial construct and so that Palestinians do not have any national rights as Palestinians, but only as members of a wider Arab nation. Meir and Gingrich assert that Palestinians did not exist as a distinct self-conscious national group in the past, and so they argue that it is wrong to consider them as a distinct nationality now. Gingrich now is using the same line of argument as Meir to argue for an uncompromisingly hard line position with regard to the self-described Palestinians. As an argument, the Gingrich position is not without its problems. For one thing, it seems to assume that there is such a thing as permanent and fixed national identities – that if your ancestors think of themselves as members of a particular national group then you too are part of that group whether you like it or not. It ignores the somewhat made-up nature of all national identities and blithely ignores the extent to which any kind of national identity is a feature of the modern world. And of course, there is another side to it that makes it problematic as an argument to bolster a hard-line Israeli position – if Palestinian identity is largely a product of history and politics since the start of the Zionist project, then the same is true of any kind of Israeli identity. The 19th century ancestors of today's Palestinians may not have thought of themselves as making up a Palestinian nation, but the 19th century ancestors of today's Jewish citizens of Israel would not have thought of themselves as Israelis either. If the Palestinians are fictional then so are their Israelis. Gingrich is of course not interested in the finer points of where national identity comes from and how it develops. He is just a slimy politician trying to win an election by adopting a position of uncompromising support for Israel that will play well with some sections of the US public. If the Palestinians are a non-people then there is no need for Israel to reach any kind of compromise with them. This kind of argument plays well with the right wing supporters of Israel in the USA, or so Gingrich hopes. As is often the case, this is another instance of Israel's US supporters taking a more extreme position than the mainstream of Israeli opinion. The Israeli centre of political gravity is skewed towards a nationalist right that would be off the scale in most Western countries, but by virtue of having to actually live in the Middle East the positions of the Israeli public tends to be a bit more nuanced than their more shrill supporters in the United States. Israelis who have actually spent time in their armed forces occupying Palestinian territory would find laughable the contention of Mr Gingrich that there is no Palestinian people, regardless of whether they want them to exist or not.